Recently, we've received a couple of near perfect t-shirts for Noel. This one, I've already told you about...and now we have this beauty you see to your left thanks to our pals at Fooey (doesn't he look like he really is TCOB?)! 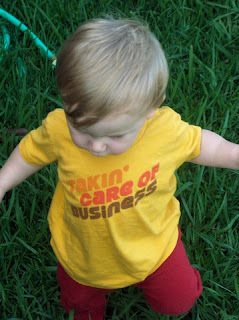 If you want some cute clothes for your tot (and coming soon for YOU! ), you must go visit Fooey right away. They offer a nice selection for babies and toddlers: dresses, t-shirts, even some really sweet artwork (they're so cool, you'll probably consider stealing from your kid)! What really caught my eye when I found Fooey, was all of the 70s inspired and cleverly sloganed duds they have. I'm all about a good slogan, and what's better suited for your kid than a shirt that says "Thumb War!"? How about a smiling octopus playing in a one man band? RAD! Your purchase will come neatly packaged in a little cheesecloth bag, so if it's a gift, no need to even wrap! Isn't that grand? Right now Fooey has lots and lots of awesome clothing on SALE, so if you want to have THE hippest kid in the sandbox, you'd better get over there right now!! !